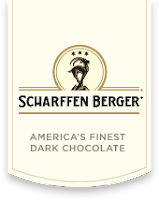 With holiday baking season gearing up, Scharffen Berger Chocolate Maker is offering a discount of $1.50 off (a savings of up to 30%) on any chocolate bar 3 oz or above. The coupon is available for a limited time on the Scharffen Berger Chocolate Maker page on Facebook. Simply "Like" the page and print the coupon at home to redeem at stores nationwide. Everybody loves chocolate! I know I will be making some awesome treats this holiday season. Scharffen Berger chocolate is made from the world's best cacao beans using a small-batch, artisanal chocolate making methods. The product line includes chocolate bars of varying cacao percentages and flavors, as well as home baking products. More information may be found at www.ScharffenBerger.com. Cut a 9 by 17-inch piece of parchment paper. Lightly butter a 9 by 9 by 2-inch pan, and line it with the parchment paper, letting it extend evenly over two opposite sides. Stir together the cream, sugar, corn syrup, and salt in a pot with a heavy bottom, and clip a candy thermometer to the side of the pot. Bring to a boil and then continue to cook until the mixture reaches 250°F. Remove the pot from the heat and let cool for 5 minutes. Add the chocolate and stir with a heatproof spoon or spatula until the chocolate is melted and the mixture is smooth. Pour into the prepared pan and spread into an even layer with a small offset spatula. Once the caramel has started to set, sprinkle with the nibs and press them in gently. Allow the caramels to cool at room temperature until firm, at least 2 hours. Lift the caramel block from the pan, using the parchment paper "handles," and place on a cutting board. Dip a knife in hot water, dry, and cut the caramels into 1-inch squares, heating (and drying) the knife as necessary. Store the caramels in an airtight container.